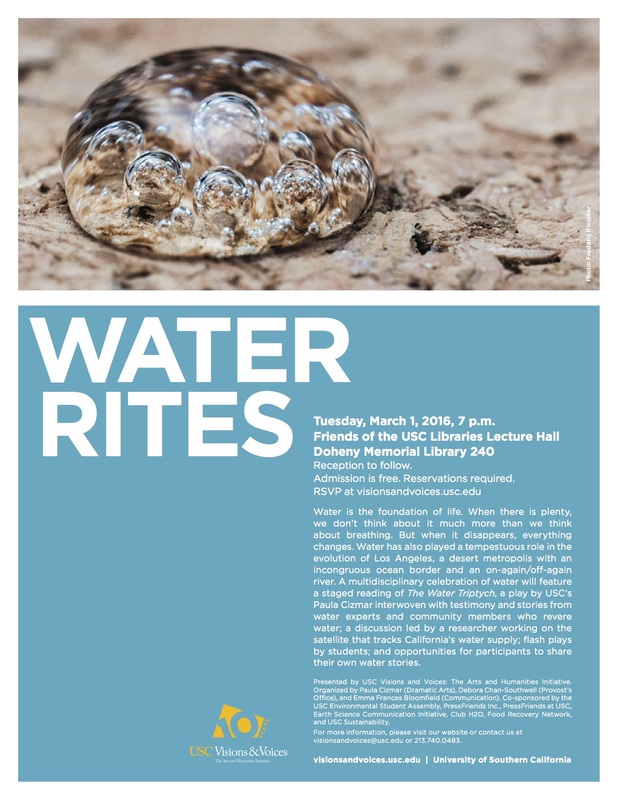 On the way soon are photos, videos, and information about Water Rites, the on-going multidisciplinary, multimedia, multi-person project that looks at water from a Deep Ecology perspective: historical, spiritual, environmental, political. –flash plays by Courtney Chism, Inda Craig-Galvan, Alexandra Hensley, Daniel Herman, Emma Lev, and Susan Lin, directed by Jonathan Muñoz-Proulx. –exhibits by USC organizations (The Environmental Student Assembly, Club H2O, Press Friends at USC, Food Recovery Network, USC Sustainability) that do community work. –audience video storytelling stations, where members of the community share their stories, concerns, and triumphs about water and water issues. Water Rites at Visions and Voices was organized by Debora Chan-Southwell, Emma Frances Bloomfield, and Paula Cizmar at USC. Check back here soon for videos about water, video interviews, information, scripts, links to organizations doing work on water.